Maybe you've bitten into a hot dog only to be hit with the shock of spice from that golden mustard on top and wonder, "Whoa, where did that heat come from?" It is not due to any added spice but rather from the mustard seeds. However, as it turns out, mustard seeds are not hot nor pungent at all—until they are cracked or ground and mixed with a cold liquid. Mustard is basically a combination of mustard seeds and a liquid. 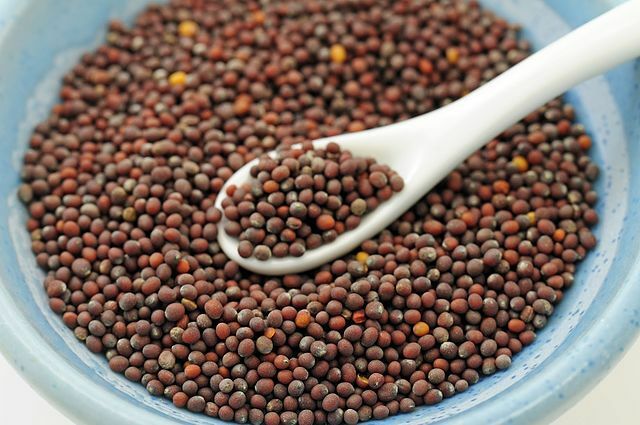 Mustard seeds contain a compound called sinigrin which is a glucosinolate (a natural component of certain pungent plants such as mustard, horseradish, and cabbage). Whenever sinigrin is crushed, the enzyme myrosinase is released, creating a mustard oil. This oil turns up the heat when the cells of the seeds are broken and mixed with cold water. This combination results in a mustard oil that can actually cause burning or blistering when it comes in contact with the skin, so be careful when making your own mustard. The combination of seeds and water reaches its peak in fire and flavor about 15 minutes after mixing and will quickly decline from that point on. An acidic element is added to prepared mustard to delay or stop this decline. However, the acidic agent often masks the true flavor of the mustard. A warm temperature also inhibits mustard's potency and flavor, so be sure the mixing liquid is unheated. The white mustard seed variety is merely hot and tangy to the tongue, while the black and brown varieties carry their heat and pungency up to the nose, eyes, and forehead. The latter two have a more intense, longer-lasting flavor and pungency than the white. This is why the mild yellow mustard is made from the white seeds and stronger mustards from darker seeds. Mustard is the second most-used spice in the United States—its usage is only exceeded by the peppercorn (usually in ground pepper form). It's no wonder since mustard works well with all types of meats, pork, poultry, and seafood. Most of us are familiar with standard yellow prepared mustard, but there are many wonderful varieties of seeds and prepared mustards to experiment with. There is so much more to mustard than its signature yellow bottle. This condiment has a rich history and many health benefits.